Oral steroid drug dianabol is designed to increase muscle mass and accelerate protein metabolism. The active substance is a Methadienone. Metadienone is an anabolic hormone capable of accelerating anabolic processes in the body and reducing catabolic hormones. In addition to the anabolic effect, metadienone enhances the splitting of fat, reduces the activity of the immune response, stimulates the development of secondary male sexual characteristics. For the first time the drug was synthesized in 1956 in the US by John Ziegler and immediately gained great popularity among athletes in power sports as a drug that can help in rapid collection of muscle mass, and also very effectively multiply the strength indicators. By the beginning of the 60s, the drug was actively used by a huge number of athletes around the world, where it is often called “di-bol” (in Russia the more commonly used name is “methane”). At first, the name “Dianabol” was used only for Ciba-Geigy products – it was their trademark. But soon it became “collective” for all products based on the metadienone. Many pharmaceutical companies actively synthesized it and sold it in various forms: pills, capsules, injections. 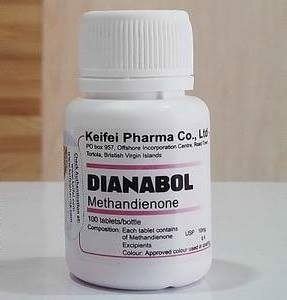 Metadienone, the main component of dianabol, is part of other commercial drugs that are analogues of dianabol. These include: anabol, dialon, stenolone, encepan, pronabol and others. Many athletes began to get acquainted with sports pharmacy from dianabol. In addition to sports medicine, metadienone has found application in clinical practice, in particular for the treatment of chronic renal failure, burns, fractures, as well as violations of protein metabolism. The drug is intended for oral administration and is available in tablet form in the following dosages: 5, 10, 50 mg.
To increase the anabolic effect, dianabol can be used with other steroids, such as testosterone, primobolan, nadrolone, trenbolone. Almost all injectable steroids go well with the drug “Dianabol”. However, it should be understood that with an increase in the dosage of the injectable anabolic, the effect of dianabol is significantly reduced. For example, when using testosterone in a dosage of 500 mg, dianabol at times increases the effectiveness of the injectable anabolic, and at an increase to 1000 mg – only to a small extent. When the concentration of 2000 mg of anabolic steroid is reached, the effect of using dianabol becomes invisible at all. As has been shown by many years of experience of athletes, the use of anabolic in high concentrations does not make sense. Dosage of the drug over the recommended (30 mg) gives the same result as the maximum allowed. Also, do not use combinations of similar drugs (dianabol and anapolon), since the effects are not stacked. The best results in the collection of muscle mass and increase in strength showed combinations of dianabol with injectable anabolics. The effect of the drug is based on enhancing the synthesis of structural proteins, increasing the rate of tissue respiration and the synthesis of ATP. Stimulation of anabolism and a decrease in catabolism leads to an increase in muscle mass and a decrease in the volume of fat. Due to the influence on hemopoiesis, the synthesis of erythropoietin, which enhances erythropoiesis, is stimulated. It indirectly affects the immune response, increasing and decreasing the fractions of the complement system. Androgenic activity of dianabol is manifested by stimulation of secondary sexual characteristics. Dianabol is designed to rapidly build muscle mass and increase strength. Also, “Dianabol” contributes to increased appetite, a slight burning of fat deposits, a reduction in pain in the bones and joints. Due to this drug, calcium and other microelements are retained in the body, which positively affects the condition of bone and muscle tissues. Hereditary blood and blood supply also improves the flow of blood to muscles and other organs, which significantly increases the effectiveness of training. Thanks to anti-catabolic action, a temporary blockage of cortisol receptors occurs, which leads to the preservation of muscle mass. The daily dose is 30 mg. The initial dose is 10 mg. The effect of the drug is 6-8 hours. The duration of the presence of dianabol in the blood is 8 weeks. The recommended course of the drug is 6 weeks. The rest period after the use of dianabol weight gain should be twice as long as the main course. The drug is taken 3-4 times a day with meals or half an hour after. For beginners, heavy weight athletes are recommended to use dianabol without adding other drugs. The initial dosage is 10 mg, with an increase to 30 mg. The course of admission is six weeks. During single use after the third week, it is recommended to add drugs that prevent anabolic fragrance. Dianabol and testosterone. Designed for more experienced athletes. The course of admission is 6-8 weeks. Daily dosage: dianabol – 30 mg, testosterone – 100 mg. Both esters of testosterone, and dianabol are drugs exposed to aromatase, therefore, the use of anti-aromatase preparations is required. Antiaromatase drugs are used starting from the second week, and ending five days after the last dose of testosterone. Dianabol and nandrolone. Daily dosages: dianabol – 40 mg, nandrolone – 250 mg. The course is 6 weeks. To exit, you can use stanazol for 40-50 mg for 8 weeks. For post-course therapy, the use of clomid is recommended (the first days of the dose reach 100 mg, then 50 mg). Dianabol, Nandrolone, Sustanon. The course is for professional athletes. Recommended daily dosages: dianabol – 30 mg, nandrolone – 250 mg, sustanone – 500 mg. The course of admission is 8 weeks. Yield: starting with the ninth week, the administration of testosterone propionate in (100 mg) or stanazole (40 mg) for another 2 weeks. To prevent side effects: from the second week of the course of anabolic drugs anti-aromatase preparations are mandatory. Post-course therapy includes the use of clomid for 25 days (5 days in a dosage of 100 mg, the rest – 50 mg). Dianabol, boldenone, stanazol. The course is intended for athletes who wish to avoid side effects. Recommended daily dosage: dianabol – 30 mg, stanozol – 40 mg, boldenone – 750 mg. The course of admission is 12 weeks. Dianabol is used from the first to the eighth week, boldenone (injections) – from the first to the ninth, stanozol – from the ninth to the twelfth. Post-course therapy: tamoxifen for a month (first week 20 mg, then 10 mg). Dianabol, trenbolone, testosterone enanthate. The course is for professional athletes. Recommended daily dosage: dianabol – 40 mg, trenbolone – 300 mg, testosterone enanthate – 500 mg (750 mg). The course of admission is 10 weeks. For 8 weeks, all three drugs are used, then 2 weeks of stanozol (50 mg). To prevent side effects, the use of aromatase inhibitors (anastrozole) is necessary during the entire period of the main therapy and for 2 weeks after. Post-course therapy is based on clomid (100 mg for 5 days, 50 mg for 20 days).